The Federal government is out of control. Government overreach has become a plague on our country and has risen to ridiculous levels. His crimes: making and selling herbal health products that were not “adequately labeled”, and obstructing a federal agency. According to TheDailySheeple.com, the farmer, one Samuel A. Girod of Bath County in Kentucky, was convicted last March 13 for growing, manufacturing, and selling herbal supplements without approval from the U.S. Food and Drug Administration (FDA). Moreover, Girod was also charged for threatening a person who attempted to provide relevant information regarding his illegal activities to a grand jury. Girod made his own herbal supplements. He sold his own herbal supplements. 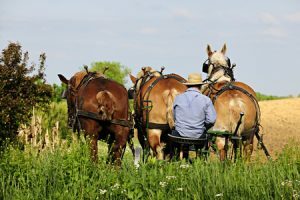 Being Amish, he feels that government control over his herbs and over his business are violations of his religious convictions, so he would not allow the FDA to peruse his property and would not bow down to their regulations. So, a Federal judge had him thrown in jail. It’s just another example of government feeling the need to utterly control every little aspect of our lives “for our own good.” Never mind that it violates Girod’s First Amendment rights to have government regulate his business. Apparently, the Feds think their non-existent right to protect us from doing something good for ourselves overrules Girod’s right to practice his religious faith. What do you think about the Feds conviction of Girod? Sound off below. Last time I suggested what they should do to a corrupt judge or attorney, they sent to U.S. Marshalls to “interview” me. Draw your own conclusions. No. Legalizing is a foot in the door for the devil to get a toehold. How can we stop the government overreach? I’ve thought about this for a while. I think the only long-term solution is if we can force all governments to allow free movement between countries, then countries will have to compete for us and this non-sense will stop. Alternatively, on a smaller scale, we could try to drastically reduce the power of the federal government and force states to compete for us. That’s true but evil people devised a way around it; that way consisted of creating “Useful Idiots” these useful idiots are controlled by the puppet media, this couldn’t be any clearer than it has since Donald Trump came on the scene. BTW the framers of the Constitution warned us that we would have to guard it or else evil men would come in and steal it, it’s obvious we didn’t guard it and we can add evil women to that. Big Pharmaceutical companies paying people off to put this man away because his products work. And so that people have to buy big pharma drugs! Free Market Capitalism in America today is becoming something of the past, America is closer today to Fascism than any form of government. If a private citizen came up with a cure for any deadly disease, they would either be bought off, simply disappear or commit suicide. Same thing would happen to someone who invented an alternative cheap and non-polluting source to replace oil. The Federal government has been violating the Constitution since 1861.
sure, put a guy in jail for making herbal remedies that harm NO ONE, but award baby killers with millions of dollars for killing children. Interesting court system we have today. Sieg HEIL!! As the government (of, by and for itself) becomes more intrusive into every aspect of life, it must either be worshiped or destroyed. The choice belongs to the people. You judge are part of the problem. You sure as “HELL” are not part of the solution. I guess if I want to chew on goat weed some Federal Bureaucrat will find something wrong and have me locked up so the government will protect me from myself. I recently started taking Herbs and can already tell a difference. This is after taking prescription drugs for 10 years that did no good. I guess some people in dark suits will be knocking on my door. There was a police officer in charge of the Las Angeles narcotic squad, he was writing a book about the government not wanting to stop the flow of drugs coming into this country, this is too long to put on here, but his website has been taken down as he was supposed to have committed suicide, I think he was only 53, his family and friends said no-way he committed suicide. Look up Ted Gunderson an FBI retiree who received numerous awards, but when he began exposing government corruption he was ostracized by many at the FBI and some calling him a nut, he passed away supposedly from cancer but his medical doctor friend says he was poisoned, look him up on you-tube and a website in his name, he has much to say. That’s why you got to keep a low profile and do everything on the down low now, why I don’t post videos of what I do. What a travesty of justice to imprison a man just for selling food supplements. He didn’t force anyone to buy them but because the FDA wasn’t allowed to rule over him, he will now go to prison. This is similar to the Amish man persecuted for selling raw milk. If I want to drink raw milk isn’t that my business not the concern of someone else? I drank raw milk from a farm years ago as a child and it was very good. I was fine afterwards. Consider the fact that the FDA doesn’t have to certify cosmetics or diet products at all. many being herbal yet simply allowed to float on by without any type of control. Pharmacist sell them in their stores. Too often not being aware of the fact that many are filled with things which interact with medicines and that can literally kill a person if they aren’t careful . Vitamines and many suppliments that are sold on line are not labeled properly and they to can be deadly if not used properly. When a person is using an antidepressant for instance and use a number of herbal suppliments they could die or be made quite ill. Germany has pharmacy herbs. A person just ask the druggist for something for a certain ailment and will be given herbs instead of chemicals. What the Government wanted to do in this mans case is to look at how his herbs are grown and to regulate them. At times literally shutting down an operation due to failure to comply. As in the case of Amish Dairy cows and raw mild products. Assuming that the man was convicted via a jury trial, it seems like the government presented a convincing case, or possibly that the jurors were so in awe of “government” that they forgot that it was their sworn duty to act on the basis of evidence. Of course, there is also the concept of Jury Nullification, which it seems to few people are aware of. Bet the Amish were not represented on the Jury. Where were the peers? No one should ever be locked in a cage when there is no victim. I thought the FDA regulated drugs not vitamins or herbal products. Was he making claims as if they were drugs? or would cure any disease? or sickness? That’s what I was thinking. If you go into a health food stores all types of herbs etc are for sale, but they don’t say cure on the label. Yet on the internet there are cures for everything, with all these personal recommendations, and none say FDA Approved on the ads. I had a friend who was told he could heal his hurt toe if he put some kind of weed in a bucket with water it would get better, an American Indian remedy, It probably have gotten better without the bucket of weeds, but the toe didn’t hurt as much with the weeds. if he went to a Doctor he would have had a bandage on the toe, told him to take aspirin for the pain and charges him $50. Either way the toe would have healed, but would have his $50., and didn’t have to pay for aspirin. This is one of the craziest things I read today. The Amish are not criminals and they do not kill people. Has the so called “justice system” totally filled with ignorant, mean people these days? It looks that way from what I am reading online and in the news. How about some political person in Kentucky lobby to have a pardon for Girod, or the American Civil Liberties Union take on this case and actually help someone for a change. It is sinful how these liberal judges will put innocent people in jail for no reason, YET criminals who grow and sell pot and drugs to kids, roam the streets with no repercussions. Government is OUT OF CONTROL. This is bad as Tyson Chickens cancelling Labor Day for their employees because of Muslim employees and Ramadaan. This country is upside down. One of the problems in this country IS the drugs business (including pharmaceuticals). Between donors and lobbyists, this country doesn’t stand a chance unless someone with courage in Congress and other leaders does something. Probably reason Obamacare not being changed.